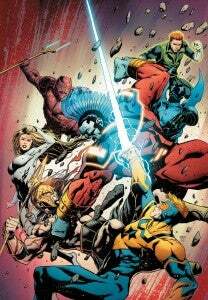 Will DC Comics Kill the Whole Justice League International Tomorrow? With a $4.99 price tag and an "annual" numbering, most fans probably think they can walk right into Justice League International Annual #1 and understand what it is they're looking at. Are they right, or do you need to pony up another four bucks to get Justice League #12 (which is likely to sell out everywhere) in order to get a handle on the story? In an interview with USA Today, Dan DiDio and Geoff Johns seemed to hint that the issue they wrote--which hits stands tomorrow--relies pretty heavily on Justice League #12 (also out tomorrow, and the subject of much discussion this week as it's the issue that puts Superman and Wonder Woman together as a couple). "The annual sets up a big mystery involving Booster Gold," teases the article, "has one character greatly affected by the newfound relationship between Superman and Wonder Woman (one reason why you should read Justice League 12 first), and sets the stage for a bigger role in other DC books for the all-seeing Brother Eye from the OMAC series." It also notes in the opening paragraphs of the article that the annual, which sets the stage for the Steve Trevor-led Justice League of America #1 in 2013, will "continue a plot thread from Justice League issue 12." Given that there are no lineup similarities and little apparent connection between the current JLI and the forthcoming JLA, it's hard to imagine how exactly that might work, or why they would be introducing a pair of new members to the Justice League International, in the final issue of the series if they weren't looking at either relaunching or doing something else worthwhile with the JLI characters. And, of course, you've got the other, unspoken option: As DC has done in issues like Titans East #1, it's entirely possible that fans of characters like O.M.A.C. and Booster Gold might open up the issue tomorrow and find the entire team they've been following for the last year used as cannon fodder to establish "street cred" for Johns's new team. It seems unlikely on its face, given the writer's stated affection for Booster, Blue Beetle and others, but it's hard to ignore that the preview pages seen at USA Today see Guy Gardner (yet again...yawn) threatening to walk out on the team, and that nobody besides him and Blue Beetle (a character whose scarab could take over anyone and fool us in solicitations) seem guaranteed to appear in DC books after this month.